You know how in airplanes, there’s the safety warning before take-off? What does it tell you? 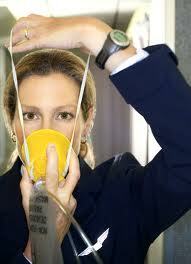 Put the oxygen mask on yourself first – THEN you can help others. Because, duh, if you’re not breathing anymore, you’re not going to be all that helpful! Yet so many people, when something really bad happens in their life, think that it’s their duty to help everyone else and put themselves last. Like this will incur some sort of Divine Favor or something. Or they put on a happy face, or “be strong for the family” or whatever other nonsense we tell one another. “Chin up!” and “Get Well Soon”. Putting the oxygen mask on yourself first is LOGICAL. It’s a great metaphor for taking care of your self – for two reasons. First, if you fall apart, you become someone else’s burden; and second – you can’t contribute your gift, your inner beauty, your talent, your compassion or creativity, your love or your intelligence, your destiny or your mission to the world if you’re gasping for air yourself. We need you. Please take care of yourself! We all admire firemen and police because they rush in during a crisis. That’s brave and noble and needed! But they aren’t the people directly affected. It’s not their liquor store that’s being robbed; it’s not their mother found on the floor not breathing; it’s not their domestic violence event. The reason the emergency people can work calmly and do the right things is because they’ve undergone rigorous training – and their own emotions are not involved. People in the immediate aftermath of a disaster in their lives are usually not capable of being calm: this is happening you! If you’re in the acute suffering stage TAKE CARE OF YOURSELF! Be easy on yourself. Don’t take on that extra project at work or your kid’s school. Use your sick day to stay home and journal about your pain. Spend the money to get a therapist. Be gentle. Give yourself a break. As grown-ups, other than when you’re in the hospital or in desperate need, we’re expected to care for ourselves. This creates an isolationist culture, where when people are really, truly, deeply hurting, they put on a show for others. They say, “No, no, I’m fine. How are YOU?” They pretend they don’t need anything. They’re strong and tough. (One sometimes sees men going through painful divorces showing overwhelming false bravado.) People sometimes lie or hide their pain so that hopefully, others can’t see it. Failing to care for yourself – to put the oxygen mask on yourself first – prolongs your suffering! Especially women are trained to take care of others, to be selfless, to give and give – even when it’s time for them to receive. If YOU are going through a rough time right now, it’s your turn. Here are some ways to help yourself at a very basic level to start breathing again. There will be a time for you to give, but for now, on behalf of the world: here’s your permission to receive. 1. Commit to telling one person every day how you really feel. It could be the surprised cashier at the grocery store, or it could be your friend or partner. (Suggestion: don’t choose your minor child.) Sometimes, someone will comfort you by sharing their own story. This is an attempt to bond. Accept it compassionately. 2. If you feel overwhelmed by an emotion, immediately – and I mean right away – excuse yourself from the situation. At work, go in the bathroom or shut your office door and process it. Either schedule a time you will let the emotion overwhelm you (which is far different than ignoring it in the moment!) and take a few breaths, or process it right now. The day before my children’s funeral, I was afraid I’d start screaming during the service and never stop for the rest of my life. Crying and screaming doesn’t last forever. You’re not physically capable of it, for one thing. Emotions pass, even if the baseline (for now) is just pure sadness. 3. Go into nature. Even just a park. Lean your back up against a tree. Look up at the sky. Go to the lake or the ocean for an hour. Or lay on your belly in the grass and watch a bug walk around doing who-knows-what. Buy yourself a flower or a plant and really study its structure, its colors. Nature has a restorative effect on the human spirit. Even 10 minutes can profoundly effect your mood. 4. Write it down. Even if you’re not a writer. Pour it out on the page. Use every adjective you can think of to describe your feelings or the person you think harmed you or the emotion you are experiencing or how it has all impacted your life. Then – I know this is weird but it works – re-write the first word of every paragraph on a new sheet of paper with a pen…with your opposite hand. This stimulates the other hemisphere of your brain. That hemisphere accesses a different perspective. Just try it – you’ll see. when you do it, everybody around you also wins! “The Top Ten Tips to Coping with Crisis”? Posted in Chronic Pain and Illness, Depression, Grief & Death, Hope, Managing Emotions, Relationships by Wendy. ← Rate Your Pain, Win A Prize! Wow! This is just what I was saying to my sister last night! I am just starting to take care of myself – making doctor, dentist, hair appointments for ME. I am on the verge of tears after reading this. It hits the mark! Thank you for sharing this. Good for you, Kim! It’s so important! Women are taught not to do this, so it can feel difficult in the beginning. I believe the trick is finding the balance between what’s good for you and what’s good for others. This is soo important! Thank you for putting into words what I have been learning to do for the past 6 yrs. Wish I had understood this years ago. Sooo glad I get it NOW!